When employees have the ability to access their apps anytime, anywhere, and on any device, employee satisfaction improves and employees become more productive. Workspace transformation with virtual desktops and applications offers employees the access that they require, but choosing amongst a wide range of solutions can be a demanding task. 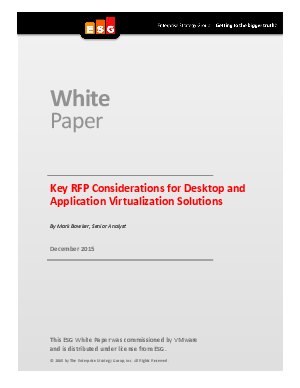 This guide is designed to help create a Request for Proposal (RFP) in support of virtual desktop and application delivery. Read on and explore three key areas to a successful workspace transformation – people, process, and technology – and important questions to keep in mind when looking at each area.